A late goal from Elliott Buchanan saw Lewes fall to a 2-1 defeat against a Kingstonian side who played for over half of the game with ten men, reports Tom Harper. Darren Freeman made one change to the side that beat Harlow Town 2-1 in their previous game, with Tom Day replacing Steve Brinkhurst in the starting line-up. There was also a place on the bench for new signing Kieron Pamment, who arrived at the club from Burgess Hill at the end of the week. Kingstonian made a bright start and nearly took the lead early on, as David Fitzpatrick headed a James Daly cross from the left over the bar at the far post. The hosts continued to create the better opportunities, and Lewis Carey was forced into a smart save to keep out a close-range effort during a goal-mouth scramble before the loose ball was cleared off the line. Kingstonian finally made their early dominance count after 14 minutes through Daly, who reacted quickest to finish from close range after Carey had denied Louie Theophanous. Lewes gradually came into the game as the half progressed, with Smith forcing Rob Tolfrey in the host's goal into his first action of the game with an effort from the edge of the area. Kingstonian continued to look dangerous going forward though, as Elliott Buchanan put a Fitzpatrick cut-back over the bar when well placed. The Rooks were handed a boost just before the break, as Kingstonian midfielder Tommy Brewer, who enjoyed a brief spell at the Pan back in the 2012/13 season, collected two yellow cards in a matter of minutes and was sent off. Lewes made the most of their numerical advantage within a minute of the restart, as Ronnie Conlon beat his man down the left and crossed for Smith to volley past Tolfrey from close range to level the scores. Pamment was handed his debut just before the hour and nearly made an immediate impact, seeing his long-range strike saved by Tolfrey. The Rooks were enjoying most of the possession, but were finding it difficult to get in behind Kingstonian's well-organised back four and force Tolfrey into any meaningful action. As the half progressed, the hosts seemed to sense they could still collect all three points, with substitute Sean Francis shooting just wide from the edge of the area at the end of a driving run forward. Lewes' best chance came in the final ten minutes, as a Lawson corner from the right dropped into the path of Smith, who could only steer his half-volley wide. Kingstonian nearly made the most of this let-off immediately, Carey saving bravely at the feet of Theophanous. 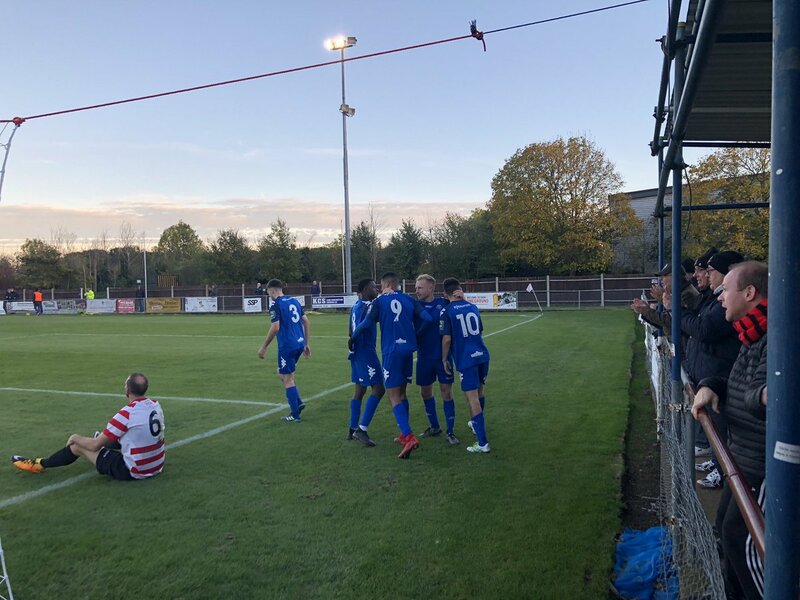 The Rooks were unable to clear the resulting corner, and an Alfie Doughty cross from the right picked out the unmarked Buchanan in the six-yard box, with the striker heading home to put the hosts back in front with six minutes remaining. Lewes were unable to create a chance of note to equalise in the closing stages, and were left to reflect on a second half which saw them enjoy plenty of possession without really causing the Kingstonian defence too many problems after equalising in the first minute of the half. Manager Darren Freeman was full of praise for the hosts when he spoke to Barry Collins post-match. Next up for the Rooks is a Sussex Senior Cup second round tie against the Brighton & Hove Albion U23s on Wednesday at the Pan, kick-off at 7.45pm. Kingstonian: Tolfrey, Gogonas, Brown, Lamont, Brewer, Gasson, Fitzpatrick (Dymond 38), McAuley (Francis 46), Buchanan, Theophanous, Daly (Doughty 56). Lewes: Carey, Day (Elliott 85), Wilder, Dome-Bemwin Chappell, Freeman, Darbyshire (Pamment 57), Lawson, Smith, Conlon, Hammond. Unused subs: Blewden, Appau, Reed.